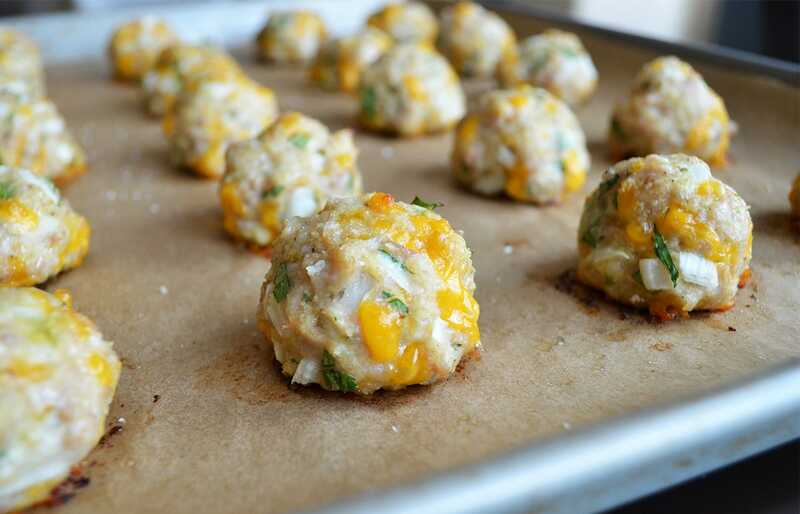 We are starting by making Ranch Cheddar Chicken Meatballs, but it will not stop there! Then we will turn these delicious meatballs into a complete dish that puts an amazing twist on your classic spaghetti and meatballs, substituting a light and creamy parmesan sauce in place of your typical marinara for an ultimate pairing. Just imagine grabbing one of these bad boys pictured below right off the pan, they are so delicious all on their own. Then making your spaghetti with parmesan cream sauce and placing these little addictive meatballs right on top. You can add more fresh parmesan or chopped fresh parsley to garnish of course. One thing is for sure…I’M IN LOVE! These Bacon Cheddar Ranch Meatballs and Spaghetti are my newest obsession and I’m pretty sure you will become infatuated with this dish once you try it. 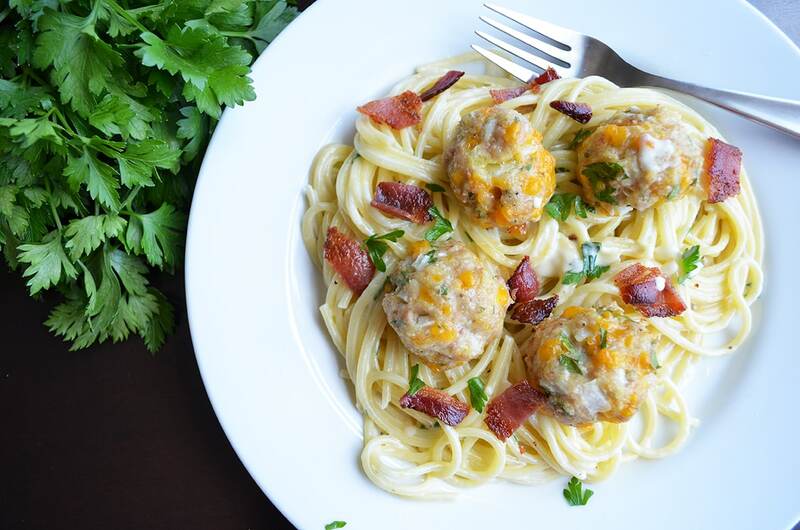 BACON, CHEDDAR, RANCH AND CHICKEN… The craze that is currently sweeping American dinner tables and this Bacon Cheddar Ranch Meatballs and Spaghetti is taking the combination to a whole new level. My children woke up this morning asking to eat this for breakfast, too funny. Like most children, getting my little’s to eat meat is quite the challenge, unless it’s bacon because they are like their Mama. So, when they kept grabbing more of these meatballs off the tray before I could get them to the table I was delighted. Not only did the entire family love this meal, it instantly became my new favorite dinner. The meatballs alone are packed with so much flavor and then you top this entire creamy meal with BACON! The only issue I’m having right now is resisting the compulsion to make this cheesy, bacon filled, pasta and meatball deliciousness again tomorrow. I’ll have to end this post here because I am about to go reheat the small amount of left overs for my lunch today (EXCITED FACE). Maybe I’ll share with the kids or possibly hide in the kitchen corner on the floor praying no one comes over while I’m inhaling this AMAZING dish. PIN IT, SHARE IT but most importantly start your grocery shopping and make this Bacon Cheddar Ranch Meatballs and Spaghetti today! You can make these amazing Cheddar Ranch Chicken Meatballs as an appetizer or take it a few steps further to make the complete meal.